I was recently introduced to Jamaican Jerk chicken. Perhaps I’ve had jerk chicken before, but this time around, it was from an authentic restaurant in Maryland – Just Jerk. My sister and I were invited to the restaurant by her friend and neighbor Andre, who is actually Jamaican (in fact, you can see both my sister and Andre walking into the restaurant in the photo above). Inside this bright and unpretentious place, on a cold, grey and rainy spring day, we sat at the counter and ate directly from foil to-go-containers using plastic forks and knives – and yet, I couldn’t have been happier. 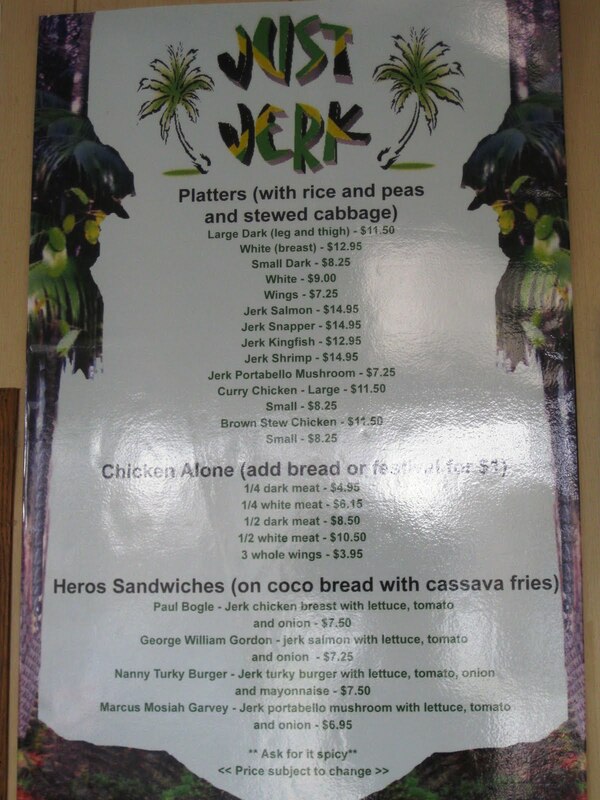 If you click on the photo of the menu, you can see for yourself that Just Jerk offers quite a few of the Jamaican delicacies. Under the guidance of Andre, I decided to order a “Large Dark” platter. The platter, or rather a to-go-container, came packed to its capacity with rice and peas (peas are actually small red beans), stewed cabbage (the cabbage was surprisingly still slightly crunchy) and most importantly Jerk chicken (thigh and a leg). And did I mention slices of sweet plantains? The word “jerk” actually refers to the cooking method and the spice rub – traditionally the rub is made from seeds of the scotch bonnet pepper, allspice, thyme, garlic, lime and orange juices, cinnamon, black pepper, brown sugar and nutmeg. I’m pretty sure that similar ingredients were used to make the sauce for the chicken. 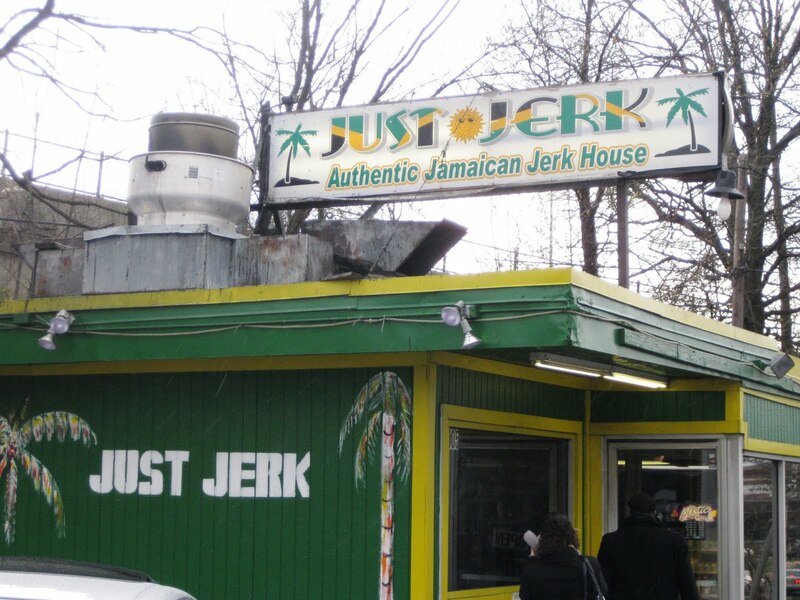 (When I politely asked the lady working at Just Jerk for their combination of spices, she declined to share, saying the recipe was secret). My first bite was the chicken – I’m trying very hard not to use the word “moist” but that’s exactly what came straight away to my mind. Apparently, Just Jerk actually steams the chicken which makes for very succulent and tender meat. (From what I’ve read, steaming is not the traditional method of cooking jerk. Instead the meat is first marinated and then grilled for a long time over a low burning BBQ). My version of jerk seasoning was of regular heat – it was by no means completely mild, but had a nice little kick to it. Turns out, one could ask for a spicy option, but there’s nothing in between. When I tried the spicy Jerk chicken that Andre ordered I decided that I could’ve definitely tolerated a spicier option – perhaps on the next visit to Just Jerk. Shamefully, I didn’t choose any of the Jamaican juices for a beverage and went straight for a Diet Coke. To redeem myself and my palate, I happily shared a small container of mango ice cream that Olga bought on our way out. And yes, we did use plastic spoons to devour this sweet, frozen delight. I must admit, that at first glance I thought that paying $12 for a plate of rice and chicken was slightly over priced, but as I was taking close to half of the plate back to my sister’s apartment, both my stomach and wallet were happy. I welcome you to check in a few days to see what happened to the leftovers of Jamaican Jerk chicken. 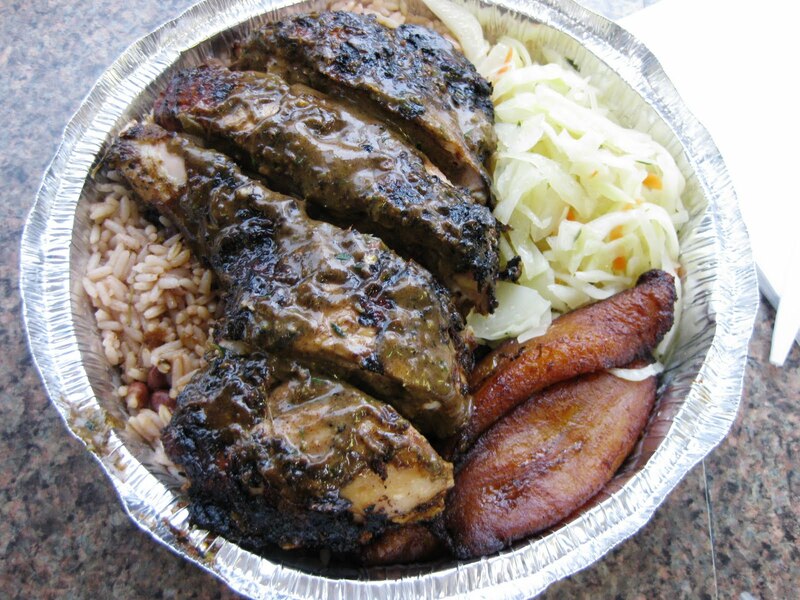 And if you have a recommendation for a Seattle restaurant that serves great Jamaican Jerk chicken and other Jamaican dishes, please share! Thanks.